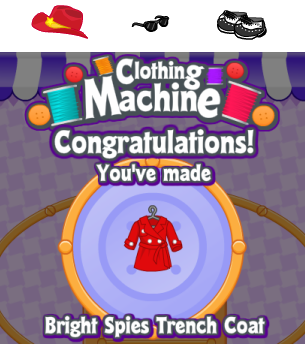 Re: New Clothing Machine Recipe Solved! Yeah really!!! I'm surprised at the items in this!!! I love the coat though.....I think I'm going to go make this right now! I can't find cool shades in the KinzStyle Outlet. I found dark shades. Is that the item we need or do we find it somewhere else, like exclusively on the WOW or something? That's a good question, funmom256. We'll have to check that out and see. BTW, it's great to see you again. I was missing you!